As your trusted Orthodontist in the Brampton, Burlington and surrounding areas, Discover Orthodontics strive to provide the most advanced, effective and convenient orthodontic treatments available. We work continually to stay at the forefront of orthodontic technology. Conventional dentistry include impressions that are time consuming and uncomfortable for most patients. As a Diamond Invisalign Provider, we will provide you with the best possible experience, hence our movement towards advanced technological techniques to make your appointments comfortable, dare we say pleasant and as seamless as possible. 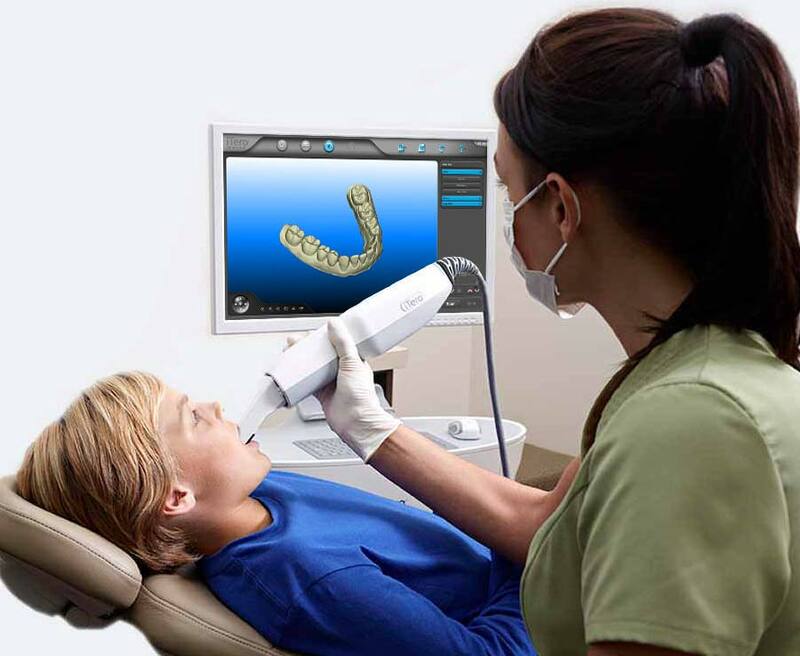 Our iTero scanner create a virtual model which allows you to see a simulated outcome of your new smile. We are using current dental technological advances to provide you with the best orthodontic experience possible. The iTero scanner has revolutionized impression taking in the same way that the iPhone revolutionized cellular phone usage. It eliminates the mess and unpleasantness associated with traditional impressions. The iTero Scanner is a radiation-free laser that in 3-4 minutes render a digitally accurate 3D model/impression by taking thousands of pictures of the teeth and surrounding tissue. It enables us to simultaneously assess your teeth and bite for orthodontic treatment. Your smile is available for viewing about a minute after your scan is completed. One of the unique features of this scanner is it’s ability to process a simulated outcome; you get a sneak peak of your new smile before starting the process. Digital scans are sent via internet directly to Align for fabrication of your Invisalign aligners. With this digitized process, your aligners are available for you much sooner. With traditional impressions, wait times are considerably longer. Say goodbye to the goop, gagging, discomfort, and anxiety you've experienced in the past with dental impression materials. It gives us the ability to assess your teeth and bite immediately. This technology is ideal for fabricating Invisalign aligners because it is very precise. It takes less time to receive Invisalign aligners, allowing you to begin treatment sooner. As a Diamond Provider and Educator, Dr Bart has over 20 years of dental experience, both in Canada and the United States of America. He has worked in the GTA including Brampton, Burlington, Orangeville and surrounding areas for over 17 years. Discover Orthodontics provide all orthodontic services, including INVISALIGN for children, teens and adults, utilizing state-of-the-art orthodontic technology. Our team strive to provide effective, convenient treatment in a comfortable, welcoming atmosphere. Please contact us today to learn more and schedule your visit today. At Discover we are passionate about your smile. We look forward to seeing you!